Even with the new flash freezing process, the most comprehensive data available reveals a 77 percent failure rate of frozen eggs resulting in a live birth in women aged 30, and a 91 percent failure rate in women aged 40. There's so much pressure on those under about 30-35 to put their careers first and delay family -- and even finding love -- but advocating this to people as a way to have both a career and a family once they've climbed the ladder is naive as best, and cruel at worst. The odds are poor, the experience is traumatic, and any failure permanent. Rather than telling workers to delay families, we should be encouraging balance early on in life for those who are happy not to be 90-hour-a-week startup founders and who just want a good career. I'd argue, and have before, that even those founder types should chill out a little, but I think it's a personality type more than a fad (though it's a type that has driven a fad, sadly). It's here, and it's glorious. When you choose AT&T on iPad Air 2 and iPad mini 3, AT&T dedicates Apple SIM to their network only. There goes any chance of me ever trying anything from AT&T ever again. Nice job. Unfortunately, Apple is now blocking sandboxed apps to change the default handler for a particular URL scheme. This is why Screens is not able to set Screen Sharing back as the default handler. This change affects a whole bunch of apps that use to rely on this functionality. 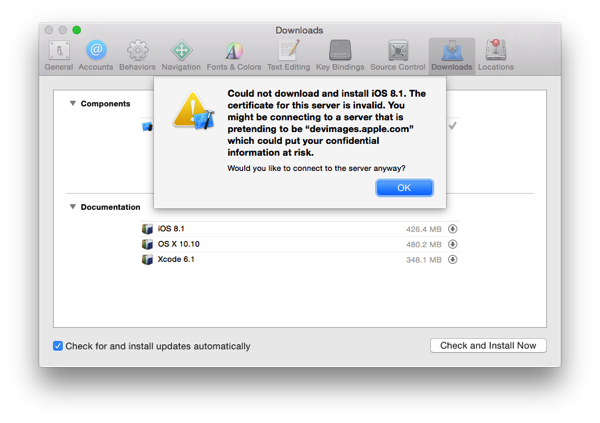 The sandboxing rules on OS X have always been a source of difficulty, as some cautioned early on. At the time I felt that Apple would see the harsh edges and work something out with developers so that more useful apps could be in the MAS over time. I thought that perhaps they’d sort it out to the level that even top-tier folks would manage to get their apps in there (think Photoshop or Office). What I didn’t consider, and I don’t think anyone really had a reason to at the time, is that Apple might tighten the requirements over time and try to turn OS X’s sandbox — ever so slowly — into iOS’ sandbox. With every release there’s one more thing that can’t be accessed, one more app Apple kicks out, and one more developer walking out because of the whole mess (be it sandboxing, the review process, generally poor communication, or whatever else). As a result, the MAS is full of ported games, uselessly simplistic productivity tools, “system utilities” that do absolutely nothing useful in the first place and are only differentiated by their appearance, and some apps that manage to hang on and haven’t done anything to awaken the Beast … yet. I think Apple’s forgotten what a desktop computer is used for in the real world at this point. When Lion came out, I stayed with Snow Leopard because I saw it as the iOS-ification of the Mac. When Mavericks came out, I was convinced that’s what was happening. Honestly, I only upgraded my OS because I upgraded my Mac and now I just hope the next version will fix something, anything that the previous ones have taken away from the Mac. Time and again, Apple tells us that it has no idea what the Mac is for anymore, other than coding for iOS and using Mail and Safari on a large screen. If there’s something you can do on a Mac that isn’t related, then it’s time to sandbox it. Time will, of course, move forward. The sandbox will get tighter and tighter. More and more developers will leave it. In the end, Apple will have ruined the one thing that could been amazing on the Mac: a thriving community of independent software makers sharing their work. Instead, they’ll have an abundance of two-year-old Me-Too games, far-too-minimal general purpose apps, and lots and lots of useless trash. Worse? People who see the MAS will think that’s all you can do on a Mac. And then leave. PS: Before it’s said, yes, this would have happened under Steve. He’s the one that started it, after all. This is what a walled garden does: it keeps everyone out. Oh pip. Every time I think you can't do it, I realize I haven't updated lately. And now you're (blindly) upgraded. I'd only use this autoupgrade for system packages, not for project packages, by the way. For those, though, the list --outdated form is still very useful while the virtualenv is active. The certificate is invalid because either they or Akamai are experimenting with self-signed certs on the CDN. To fix it, open https://devimages.apple.com in Safari and choose to trust the certificate. What gets me the most though? "Would you like to connect to the server anyway?" has one choice: "OK" — which then cancels instead. This Wouldn't Have Happened Under Steve (Except Yes, It Would). Notably absent from the list of changes in iOS 8.1 is a fix for the Reset All Settings Including iCloud Drive Data bug. I can imagine what they did, and it's kind of funny. You reset all settings, that deletes the files, the device is bound to iCloud even after the reboot (activation lock!) and then on first boot the sync gadget says "Oh hey, no files." and promptly ... syncs that. At least, that's my totally unsubstantiated guess as to the cause, given that it's taking so long to fix. It'll be interesting to know what the problem was ... someday, when someone feels brave enough to talk about it. In my experience, a lot of days are like that. What Are You Doing, Squarespace? Squarespace doesn't support editing via XML-RPC. Strike that one off the list of places to try. All opinions expressed are poorly researched, untrustworthy, presume spherical cows in a vacuum, and completely my own.